When people talk about the Bighorn River they're usually talking about the famous blue ribbon stretch of the Big Horn River below Yellowtail Reservoir near Fort Smith Montana. Most people don't realize there's another amazing tailwater fishery some one hundred twenty miles upstream near the small town of Thermopolis, Wyoming. It's on this stretch of the Bighorn River; Reggie Treese dedicates his time to providing anglers with a truly memorable Bighorn River fly fishing experience. 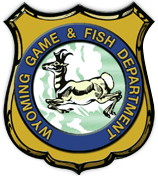 Depending on the type of Bighorn River fly fishing trips you are most interested in, fishing dries, wets, streamers, hoppers, or nymphs, its helps to know the times certain flies hatch to help determine the best time of year to book a fly fishing trip. Some of the hatches on this amazing stretch of river include the midge hatch, blue wing Olive hatch, Green drake, Pale Morning Dunn, and Tri-co hatches. Midges hatch year-round but typically the trout do not feed the surface for these adults. Pupae imitations such as Brassie's, WD-40, Disco and Red-Hot Midges in sizes 18 and 20 are great patterns to use during this hatch. Baetis, also known as Bluewinged Olives, hatch in late March. Size 16, 18, and 20 parachute Bluewinged Olives and Spent Bluewinged Olive work great to match this hatch. Green Drakes hatch in late May and early June and they are the first large flies of the year. Size 12 and 14 Green Drakes, Sparkle Dun, and Blue Winged Olives work well to represent this hatch. Trico's begin hatching in late May and provide anglers with amazing top water feeding frenzy's. Size 16, 18, and 20 Trico's, Parachute Trico's and Parachute Adams work amazingly well during this hatch. PMD's begin hatching about the same time that Trico's begin to hatch. These flies are slightly larger than Trico's and hatch about the time of day that the Trico hatch ends. At this time switch flies to a size 16 or 18 Pale Morning Dunn or Bunny Dunn and you should have great Bighorn River fly fishing success. So if you are looking for great top water action, April thru September should satisfy your appetite. If you're looking for nymph action, it can be found just about any time of the year but is most effective April through September. 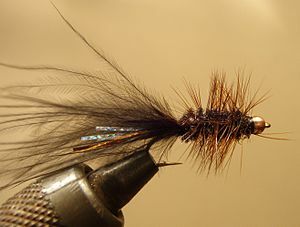 Size 18 and 20 Prince, Brassie, Copper John, Hare's Ear are just a few very effective nymphs. 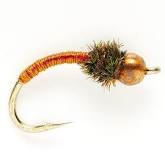 If ferocious top water strikes jump start your adrenaline, big browns and rainbows smashing hoppers along undercut banks and low hanging Russian olive trees should do the trick. Hoppers are most abundant from late August through September. Size 6 thru 12 Dave's, Joe's, and Whitt's Hoppers, and several stimulator patterns work well. 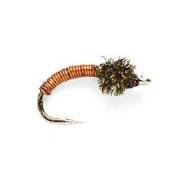 Stripping streamers or drifting large wet flies can also be effective year round. Size 4 thru 10 Muddler Minnow, Wooly Bugger, RT Special, San Juan Worm, Egg Patterns, and Blood Worms can work well any time. When you call to book your Bighorn River fly fishing adventure, be sure to ask our knowledgeable staff for the best time to arrive to satisfy the type of fishing you pursue. Bighorn River Outfitters can be best reached at 307-272-3474 to Book your next Bighorn River Guided Fly Fishing Trip.